Everywhere you look (online, tv, stores) there are companies promoting diet products, vitamins, and meal plans for losing weight. Millions of dollars are spent on advertising.There are support groups and personal coaches to guide you on your weight loss journey. I decided I should add my two cents to this billion dollar industry. At first I thought about charging a few bucks for my FABULOUS WEIGHT LOSS SECRETS but then I realized I would have to sell to a million or so people to be successful enough to retire OR convince Ellen DeGeneres to put me on her show. So being the nice person that I am, I have decided to share my secrets for free. 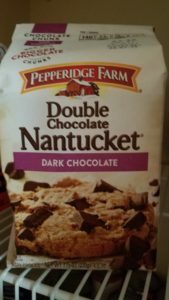 I love chocolate chip cookies and have been searching for the world’s BEST one. I actually found it at Downtown Disney in Florida. Then someone had the dumb idea to replace it with a less than perfect one. I am getting off track…sorry! THAT original chocolate chip cookie at Downtown Disney was the beginning of my”eat one chocolate chip cookie and stop” diet because I probably could have eaten 5 of them if I didn’t practice self control. Fast forward several years and my search continued for a fabulous chocolate chip cookie. THEN I found it and RECENTLY the company improved it. So now they get an entire blog written because of that cookie. Now you may wonder what a chocolate chip cookie has to do with dieting. It actually has a lot to do with it. My belief is that you do NOT have to give up what you like to lose weight. Just eat it in moderation. I once was out for lunch with a girl who had sworn off sugar. When I was coming back from the ladies’ room, I watched her pore an entire sugar pack down her throat, like a drug addict who needed a fix. (She did not see me. )Then she nibbled on her salad and talked about all the new clothes she was going to buy when she lost weight. I like sweet tea ( I live in the south) but I drink 3/4 cup water and 1/4 cup tea. I’m not a big water drinker so this serves a dual purpose. I do not love bread unless it is freshly baked so I often eat my chicken or tuna or egg salad with a few crackers on the side instead of on a sandwich. I usually don’t eat the bun on my hamburger. I bake instead of fry whenever possible. I substitute turkey for beef in most recipes. I don’t count calories. I never get on a scale. I can tell if I’ve lost weight by how my clothes fit. One last thing…I have started walking every day. I was inspired by my youngest child who has walked his way around the world and is my life coach. The best part is…He doesn’t charge me anything for his services….just an occasional chocolate chip cookie. Love this! I think I need to try this diet, espespecially with Dark chocolate chip cookies.